We offer a cost effective system of individual double stainless steel screen filter systems that mount right against the house where the downspout from the gutter meets the one on the outside wall of the house. This is usually just under the eaves but can be located lower down if the tank is lower. The units are white but can be painted to match your trim. Stainless Steel Debris screens. We recommend one at each downspout. Keep rodents, birds, insects, debris and leaves out of the flow of water from the roof to the water tank. Non corrosive unit with Stainless steel screen has a high flow rate. Parts and Labor for the onsite installation. Does not include downspout or gutter system. Usually the Individual Filters mount at each downspout outside the house. 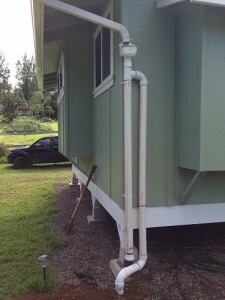 Its best location is after the gutters and before the vertical downspout. Please contact us for an estimate of parts and labor required for your best installation. When it rains, water slowly builds up in the roof gutter system before it exits through the downpipe. The first flush of water from the roof can contain amounts of bacteria from decomposed insects, lizards, bird and animal droppings . It may also contain sediment and algae which are also undesirable elements to have in a water storage system. Instead of flowing to the water tank, these pollutants are diverted with the initial flow of water into the chamber of the water diverter. 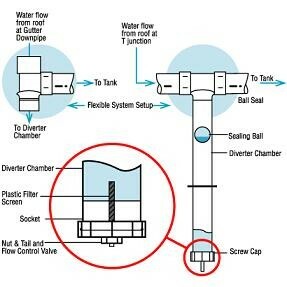 The water diverters utilize a dependable ball and seat system – a simple automatic system that does not rely on mechanical parts or manual intervention. A slow release valve ensures the chamber empties itself after rain and resets automatically. The diverted water need not be wasted water because the drain pipe from the diverter chamber can be fitted to an irrigation system. 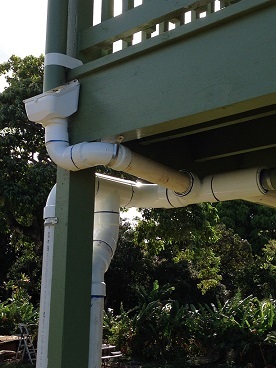 Simple and effective first flush devices are installed at the downpipe and used when there are a small number of downpipes supplying water to the tank. It is preferable to fit the longest length chamber possible to ensure better quality water. Install the chamber below the Debris Screen to within 6″ above the ground to allow easy access to the end cap. The “blue triangle” double stainless steel screen system. This design works best on small or medium size roofs. This filter system mounts out of sight inside the water tank under a dome frame supported cover. Debris, leaves etc wash out the over flow exit though the “double siphon” over flow system. (not included at this price)The whole system is out of sight accessable for maintenance inside the tank just under the mesh cover. Parts and Labor for the onsite installation. Usually the blue triangle filter is sold as part of the Eco Clean In Tank package so see that section for all installation materials and associated products. This system can handle moderate or large roofs but it require occassion manual maintenance. The basket filter lid must be opened and the basket dumped out 4 + times a year depending on the amount of debris on the roof.This system is difficult to mount under the cover and is best located between the incoming roof water and the tank with the tank located below the Roof Cleaning System. We have installed a few of these systems just below the ground approaching a lower tank very successfully. Parts and Labor for the onsite installation. Usually the Basket type Filter mounts outside the tank. Its best location is before and above a lower water tank . Please contact us for an estimate of parts and labor required for your best installation.